'Tis the holiday season, and this year the Internet offers a fascinating new aspect to holiday giving, through "crowdfunding" -- direct person-to-person support for things that you are passionate about. This can be philanthropy for individuals and organizations in need through websites like GoFundMe and DonorsChoose, early funding for artists and entrepreneurs creating new works and products through sites like Kickstarter, Indiegogo, and RocketHub, and even directly sponsoring artists through sites like Patreon. The crowdfunding model brings together creators on a mission with groups of individual contributors who provide small donations that add up to a new flowering of charity, artistic expression, and product invention. And this is serious business -- there are multiple such sites that have raised billions of dollars from tens of millions of donors. My holiday tech coverage for this year explore these possibilities for both your holiday giving and your holiday shopping. Crowdfunding Examples -- Recent crowdfunded projects, from personal and organizational fundraising, to musicians and artists, to creators and entrepreneurs who have taken advantage of this new world. And yes, including the Cat Ear Headphones from Brookstone. Crowdfunding Sites - Breakdown of different kinds of crowdfunding sites, including charitable, creative, artists, investment, and lending. Includes site summaries, statistics, types of projects, fees, and noteworthy successes. Holiday Giving: A Digital Twist to Coins in the Kettle. My Holiday Gadgets 2015 selections include both commercial and crowdfunded products (see previous post). I've focused on some innovative gift ideas from both commercial and crowdfunded sources, to make your mobile technology both more efficient and more fun. These also continue themes from last year's coverage, including wireless speakers, cables and portable batteries, portable storage, and accessories. 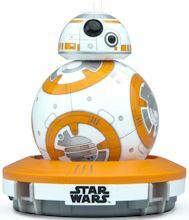 There also are exciting developments in app-enabled toys that are fun for kids and adults, including Brookstone's BB-8 App-Enabled Droid by Sphero. Full article in Princeton's U.S. 1 Newspaper: Gift Ideas for the Mobile Tech Crowd. Yes, Cat Ear Headphones from Brookstone -- really. These are the brainchild of Victoria Hu and Wenqing Yan, recent graduates of the University of California at Berkeley who are also anime fans (think of Japanese cartoon drawings with waifish figures that often incorporate animal features). They thought it would be cool to have cat-ear headphones with an anime look. So they did the product design, worked out the manufacturing, produced prototypes, and then started a crowdfunding campaign on Indiegogo to try to raise the $250,000 they needed to get to market. And it turned out people really, really liked the idea -- They raised $3.4 million in pre-orders from 21,000 backers in November 2014, at an introductory price around $115. And the story gets better. Indiegogo then approached Brookstone, which signed up to bring the headphones to market for this holiday season, along with two other crowdfunded projects. The Cat Ear Headphones do indeed have cat ears. These are actually external speakers, so you can continue to listen and share your music when you take off the headphones. And they have LED accent lights around the earcups and on the ears. The lights and speakers are controlled by separate buttons. 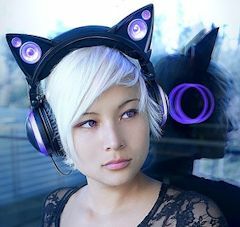 The Cat Ear Headphones are now generally available for $149, with your choice of LED colors -- blue, green, purple, or red. And they do make people smile when they put them on. - See Crowdfunding Examples for more on fun crowdfunded projects. The original Sphero app-enabled robotic ball that I covered two years ago (see earlier post) is lots of fun -- for driving, racing, programming, or messing with toddlers and cats on the floor. This season's addition is the Star Wars-themed BB-8 App-Enabled Droid (also available from Brookstone). The BB-8 not only rolls freely under smartphone control, but adds a separate head that floats on top as the body rolls -- physically implementing the computer graphics effect from the movie. The head actually is attached magnetically, and rolls along the surface of the ball with small wheels -- although it does fall off if you smack into a wall too hard, which also causes the BB-8 to stop and pout. You can drive the BB-8 from the smartphone app (iOS or Android), and have it perform predefined actions (like shaking its head "yes" and "no"). It's pretty fast, with a top speed of 4.5 mph (7 feet/sec. ), although you can set a maximum speed limit for smaller spaces. It communicates over Bluetooth, over a range of up to 100 feet. You also can set up the BB-8 to patrol autonomously, exploring an area and feeding back sensor information (speed, temperature, graph of motions), although it really is not mapping out the space. The BB-8 also responds to voice commands ("OK BB-8 -- Wake Up, Go to Sleep, Look Around, Go Explore"). And you can record "virtual holographic videos" in the smartphone app. The BB-8 is palm-sized at 4 1/2 by 3 inches (11.4 x 7.3 cm), and relatively light at just over 7 ounces. It recharges wirelessly in the charging base for a play time of around an hour. The BB-8 App-Enabled Droid is generally available for $149. - See Holiday Gadgets 2015 for more on fun holiday tech. Gift Ideas for the Mobile Tech Crowd. As an example of the kind of ingenuity that can be enabled by crowdfunding, the Digitsole Warm Series is a new "connected heated insole." If you're working outside in cold weather, just slide this replacement insole into your shoes and your feet now can be toasty warm, with the temperature remotely controlled from your smartphone over wireless Bluetooth. 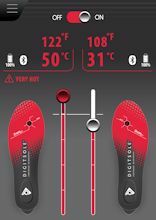 Each insole has a thermostat to regulate the temperature in your shoe, from 20°C / 68°F to 45°C / 113°F. They also have an accelerometer to count steps as a pedometer to log your distance walked and calories burned. The Warm Series are designed with a shock-absorbing heel, flexible front, arch support, and sidewalls for stability. They are made from PU Neotech, with the top a soft touch PU micro-fiber. And they are designed to resist the hostile environment of your feet, with the electornics sealed in a bubble under your heel for weather resistance and shock resistance to 500 kg / 1100 pounds. The battery provides power for 7 to 8 hours, depending on usage, and recharges in an hour and a half. The Digitsole Warm Series Insole is availaable for $199, in US mens sizes 4 to 13 / woman 5.5 to 10, and EUR 36 to 47. The Ozobot Bit is a tiny one-inch wheeled robot that provides a clever path to get kids involved in programming robotic behavior. It starts with a stunningly simple idea -- The Bit simply follows the path of lines that you draw on a piece of paper. Then you can start controlling it by drawing color patterns on the path, which are interpreted as commands to have it change speed or direction, count down, and execute other pre-defined moves. Now your kids are having fun planning races and solving mazes, while learning problem solving and deductive reasoning. Sneaky! For more fun, you can visit the Ozobot Gamezone to download free mazes, playgrounds, racetracks, and strategy or luck games. But that's just the beginning, since you can integrate the Bit with smartphones and computers. As kids get more into controlling the motion, they can go online and design simple programs by linking together a series of blocks with the same kinds of commands. The Ozobot Bit is available in white and black starting at $59. It's a stunningly clever way to expose kids to thinking about programming while they're having fun. I'm a big fan of portable Bluetooth speakers to share the music from our portable devices. There are nice small more portable speakers for an office space or hotel room, and larger ones to pump up the sound for a party. 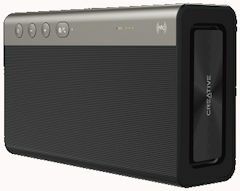 And there's the Sound Blaster Roar 2 -- the kitchen sink of portable Bluetooth speakers, loaded with features. It starts as a powerful speaker, including five drivers with built-in subwoofer. You also can enhance the sound with loudness and bass sound boost modes. You can connect it wirelessly to your phone or tablet or laptop over Bluetooth (switching between two devices), and also using NFC. Or you can connect the old fashioned way with an analog cable. Plus you can connect directly to a PC or Mac or PlayStation 4 with a USB cable, and it will serve as an external digital speaker. Or you can use the Roar 2 as a stand-alone music player -- It has a microSD card slot that you can load with music files. Of course, with the card slot and a USB connection, you also can use it as an external drive for your computer. Plus there's also a built-in microphone so you can use the Roar 2 as a wireless speakerphone, or record to the SD card -- either from the mic or from Bluetooth. Of course, the Roar 2 has a built-in battery that runs about 8 hours, and recharges in 2 1/2 to 3 hours. So, of course, you even can use it as a phone charger. Even with all these features, the Roar 2 is relatively small at 2.0 x 7.4 x 4.3 inches, but does weigh a noticeable 2.2 pounds. The Sound Blaster Roar 2 is an impressive portable speaker, available for around $169. You may not need all of its plethora of features, but they are certainly handy. For example, you can connect it to your laptop to work as a digital speaker when playing YouTube videos, and then switch to playing music wirelessly from your iPhone. Entries posted to Manifest Tech Blog in December 2015, listed from oldest to newest.